If you love your home and are passionate to invite and pamper your loved ones here, your kitchen is and should be your choicest abode. It is the heart of your home where meals and memories are made, where love takes the shape of food in reality. But, handling and organising things here could also be a daunting task for anyone who does not have an inclination for this. Either ways, www.indianlily.com has come up with apt solutions to easily perk up this space. The various kitchen accessories and organisers that they offer are sure to make your life easier in there. Utensils (all kinds of them), cooking pans, spices, vegetables, fruits, cooking gadgets, and what not. There is a lot of stuff in the kitchen. It can make cooking and cleaning an overwhelming experience for anyone. 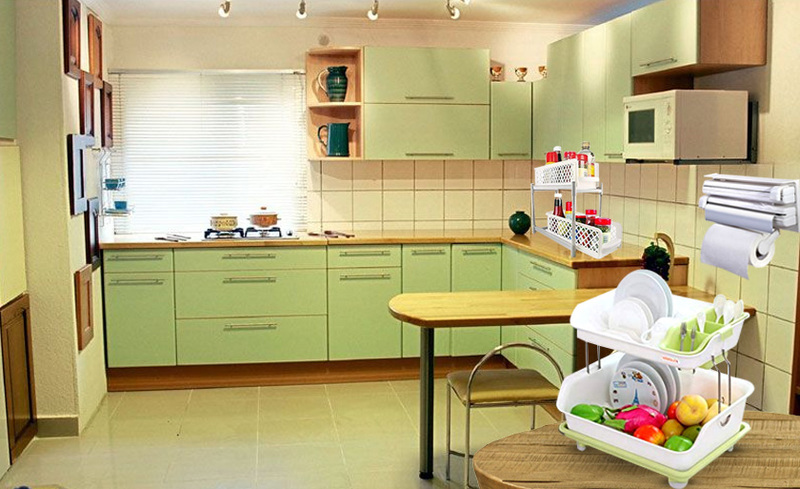 Things can be eased and sorted using the storage drawers and other kitchen storage organisers offered by Indianlily.com. These plastic organisers shall fit like a glove into your drawers and provide you with proper size-wise partitions to organise your different kinds of cutleries. It shall ensure that next time when your guests arrive; at least cutlery serving shall seem like a breeze. Dishes and other utensils are required on a daily basis; in fact, many times a day. They need to be washed and dried again those many times for proper maintenance. Our plastic dish drainer is a foldable, easily stored kitchen accessory that makes drying all kinds of dishes an easy, organized and efficient task. Moreover, this dish drainer makes your kitchen looks smarter. For your kitchen cabinets, we have the 2-tier portable sliding drawer organisers. These are basically sliding baskets to store all your bottles in a safe and secured way in your existing cabinets. Just like our kitchen dish drainers, they are made of high grade plastic and can be easily dismantled for ease of storage. With our triple paper dispensers on offer, you would not require separate space to hold your kitchen rolls, aluminium and cling foil, etc. This plastic three-tier holder can be easily hung on a wall itself with the provided hooks. Once your rolls are fitted into this stand, they can be easily used by the appropriately provided cutters. No more fighting with the foils and wraps for early morning tiffin packing or food-sealing later in the day. These small and easily affordable kitchen knick-knacks are sure to make your kitchen a much more efficient working space. Order with us here to experience their utility first hand..